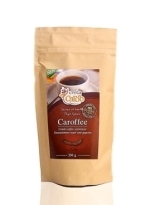 Caroffee if the substitute of coffee made by carob. It is an interesting alternative that provides our mind and body with energy to pull through a busy day. It is a natural source of vitamins and has a delicate taste. It can be prepared as your favourite coffee and you may add a sweetener, if you like.